Western Australia has 520 government schools. 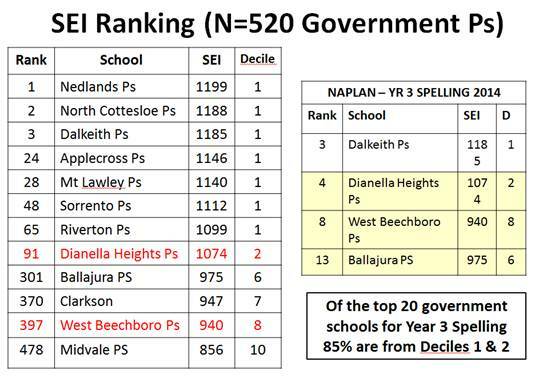 In socio-economic terms, WA's Dianella Heights PS ranks at number 91. On the NAPLAN Spelling test it ranks at number 4. WA's West Beechboro PS ranks at 397 socio-economically. On NAPLAN Spelling it ranks at number 8. Of course, NAPLAN is not the only way of measuring how well a school is doing, not by a long shot. However, NAPLAN is an objective measure of important things, and one that allows schools to get a sense of how they are going in relation to comparable schools on basic skills, and in which areas they need to learn and improve. 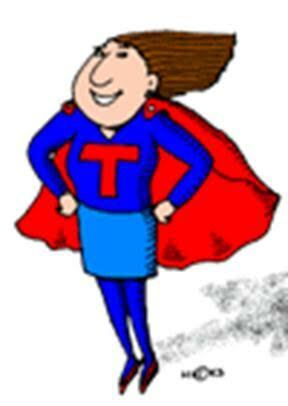 NAPLAN scores matter to teachers, parents and everyone else who wants all children to achieve to their potential. Here are the five graphs comparing West Beechboro's 2014 Grade 3 NAPLAN results with similar WA schools, on reading, persuasive writing, spelling, grammar and punctuation and numeracy. I asked ACARA for permission to use these graphs in this blog post, and they said yes, as long as I included the following statement: The author has obtained approval from the Australian, Curriculum, Assessment and Reporting Authority (ACARA) to use screen shots from the My School website for the purposes of this seminar. ACARA neither endorses nor verifies the accuracy of this seminar presentation. West Beechboro is the blue dot on each graph. So they must be doing something right, something from which other schools with blue dots further to the left might learn. On Friday 11th September the Principals of West Beechboro PS and Dianella Heights PS, Ray Boyd and Greg O'Sullivan, will be giving an all-day seminar at Mount Alexander College in Flemington, inner Melbourne. The seminar will be about the place of explicit instruction in an evidence-based approach to improving school outcomes. They will be joined by Dr Lorraine Hammond of Edith Cowan University, a teacher educator and past President of Learning Difficulties Australia. Ray, Greg and Lorraine have already presented this seminar in Sydney, where it was very well-received by school leaders. I'm helping organise this event because I'm on Learning Difficulties Australia's Council and consult to Mount Alexander College, so I hope lots of school leaders in Victoria who want to move their schools' little blue dots in a positive direction (who doesn't?) can attend. Bookings are open now, but spaces are strictly limited – click here for more information and to sign up. I'd really appreciate it if readers of this blog could pass this infomation on to their local schools. THANKS! This entry was posted in curricula, teaching strategies on August 5, 2015 by alison.